We settled on episode 2, and episode 2 is gonna feature some SIGNIFICANT drumming. Also, the late, GREAT Robin Williams. We try and keep it together. Watch Jumanji (c’mon guys it’s free on Netflix), or just trust your memory, to follow along with us as we embark on some Adventure with a capital A for AAAAUUUUGGGGHHHHHHH THE SPIDERS! Coming at you Thursday, July 23rd nerds. 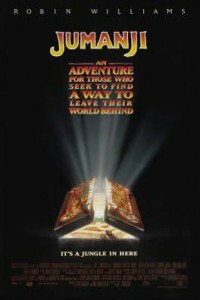 Jumanji was a great movie and book. I wish it was a real game I’d play it!